“One of the most beautiful and wildlife rich waterways,” at least that’s what the plaque said. The Itchen Navigation (not to be confused with another writer’s piece that shall not be named) is a 10 mile hike stretching from county to county. Never in my twenty-two years have I ever undertook such a challenge, and so I thought it was time to take the plunge and see just how tough hiking can be. The footpath ran alongside the gin clear river said to be teeming with salmon, bullhead and lamprey. Already this differs from the rivers around Bournemouth and the Thames, which comprises mainly of dirt, sewage and discarded contraceptives. The trail was quiet, with only a handful of joggers passing by. I was soon confronted by a charging pack of dogs covering an expanse of different breeds. Everything from Jack Russells to Shih Tzus, nearly pulling me into their boisterous stampede bearing no signs of a human owner. Eventually an exhausted man leapt from a hedged corner in the distance, chasing after them. “Calum! Calum!” he shouted as he raced past me, apprehending the four-legged frenzy. I toyed with the idea of diving for one of the dogs but instead found my thoughts occupied by an even bigger issue, ‘who calls their dog Calum?’ leaving the Crufts’ re-enactment of The Great Escape behind me. The trail led me to a parting in a nest of bushes. I managed to wrestle my way in through the undergrowth until I reached the other side, where I stumbled across a landmark omitted in the plaque. A main road. I thought perhaps I was being a tired old traditionalist, but ideally a countryside trail could do without dodging certain death by way of caravans, Honda Civics, and Travis Perkins. Regardless of the 80mph perilous freight, I took my life in my own hands and hopped across the road as fast as my little legs would allow. It was here that things started to get tricky. The walker-friendly paths were replaced by mud, overgrown grass and steep drops. 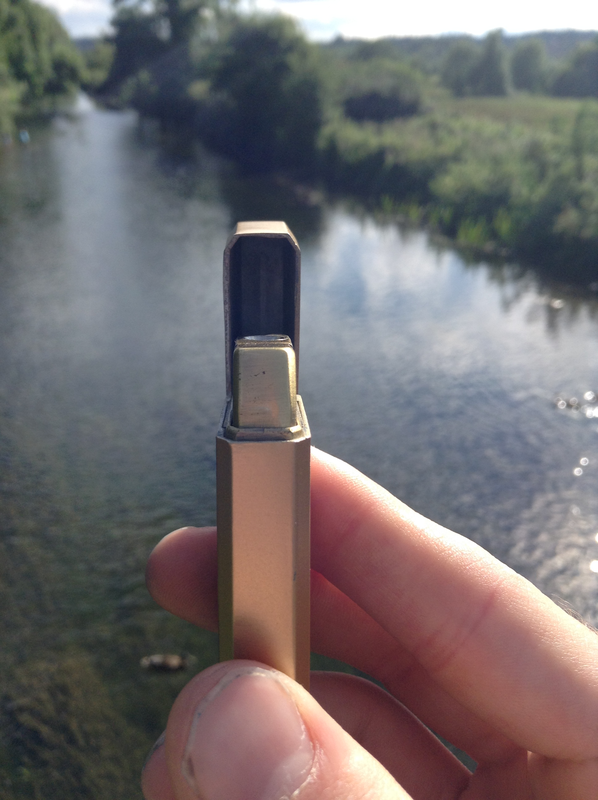 And as I looked out across the lake, I realised it was the perfect opportunity to take my lighter photo. Not five minutes into my newly discovered territory, however, I already I knew I should have worn trainers. My boat shoes, which possessed a virtually non-existent grip, meant that every step was a dance with death. One poorly placed foot, and I would be sharing my journey with Mr and Mrs fish. The traffic became more pronounced, the only thing keeping me from certain death. I could’ve closed my eyes and sworn that I was in the centre of a city. However, given all the sounds I still couldn’t see one speck of light through the dense forest. It had now become so dark I had my hands out in front of me to ensure I didn’t walk face first into a tree. And then, just as I thought I was in big trouble: concrete, civilization. As I dragged my beaten legs down the pitch black path, an orange light could be seen in the distance. I ran towards the light like it was my one and only love, and felt a rising glee as I saw what nestled in the beam- a car! Two cars! Three! Never had the sight of miserable commuters looked so wonderful. A sign directing to the “Town Centre,” confirmed all that I needed to know. I had reached the end of the trail, and all my hard work had paid off. All that was left to do was to catch the next train back, where I would return home, and sleep for a thousand years.